The Water Rider 4’s seat and handlebars are adjustable in two directions to fit most individuals. The bike’s height can also be adjusted to accommodate different pool depths. Adjustments are easily made with the turn of a lever. The brushed steel finish can withstand harsh pool environments and requires little maintenance. 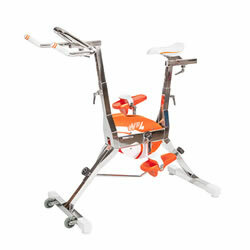 The Water Rider 4 combines fun and fitness for a more intense workout. Lead Times: Please call for current seasonal lead times. Please check all shipments at time of delivery. In the rare event a shipment is damaged, please notify the carrier immediately upon delivery and refuse the shipment. Additional shipping fees may apply based on delivery arrangement needs.